We are back to the roots! In today’s article, I want to show you some of the best ways how to underline your individuality this year. Yes, I am talking about tying the knot on your tops. This is not a new trend, but we see it around on the streets. I would say it’s a flashback from 1970’s and 1990’s decades. The invasion of knotted tops has taken all over the streets and fashion has reinvented this trend, offering us awesome outfit ideas that are easy to wear and copy in real life. I personally, find this trend vintage inspired. Remember Britney Spears, Christina Aguillera and other celebrities who tried knotted tops with fitted low-waist jeans. Well, such look is outdated. 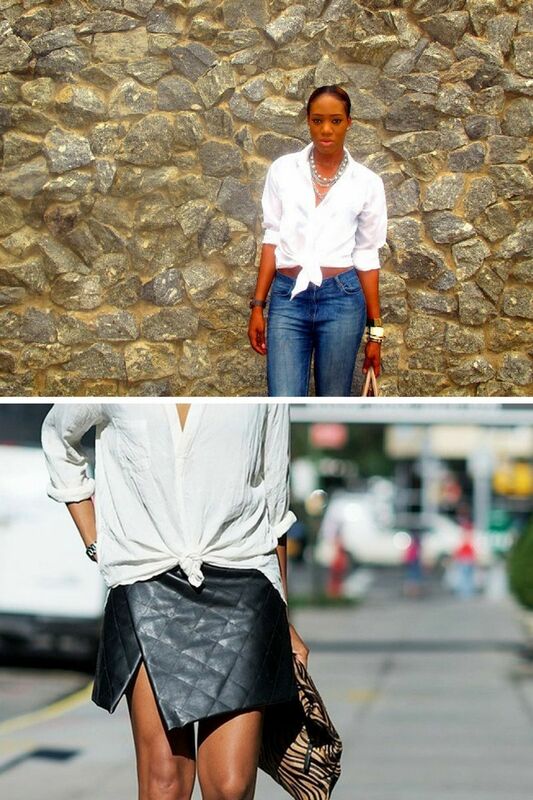 Nowadays we see knotted tops trend more flattering and stylish. Imagine Eva Mendes looking super hot in knotted shirt teamed with high-waisted pencil denim skirt, either Kristen Stewart wearing a knotted graphic T-shirt with a black blazer and classic skinny jeans or Rihanna in a slouchy gray knotted tee paired with a maxi skirt with high-slit. The knot can be tied either on your shirt or T-shirt. The result looks careless and relaxed. If you are a self-confident person, then how about showing a bit of your bare midriff? This will balance the whole look and make your style more flattering, as well as accentuate your waist and elongate your legs. The balanced look is what you need: tight jeans go well with relaxed knotted top, oversized trousers can be paired with a tight knotted top.